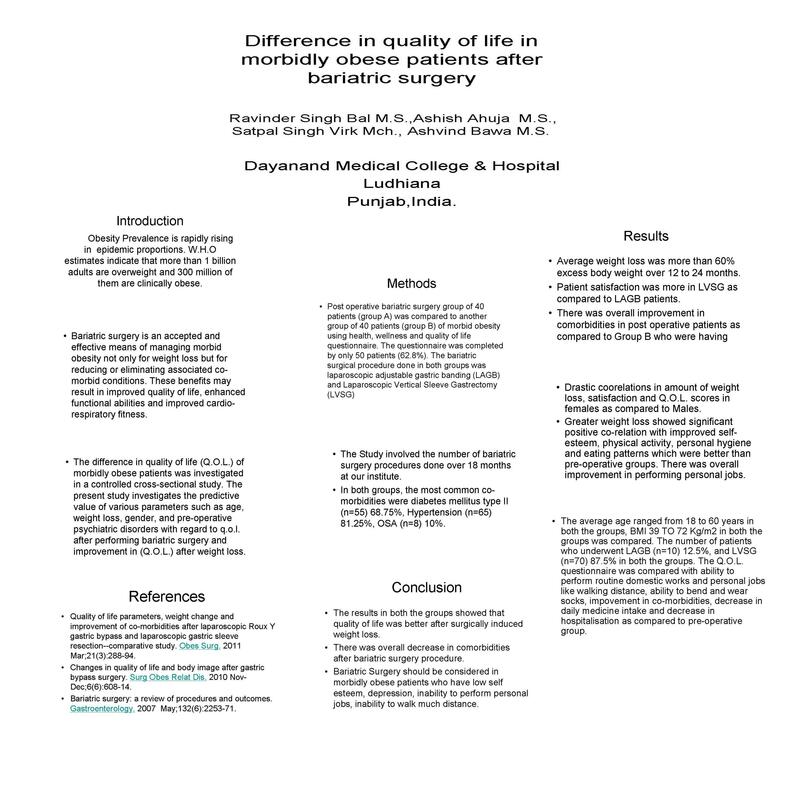 Introduction: The difference in quality of life of morbidly obese patients was investigated in a controlled cross sectional study.The present study investigates the predictive value of various parameters such as age,gender,weight loss and pre operative psychiatric disorders with regard to quality of life (QOL)after performing bariatric surgery & the improvement in QOL after weight loss. Methods:A post operative Bariatric surgery group of 40 patients (GroupA) was compared with another group of 40 patients(GroupB) of morbid obesity pre operatively using health,wellness and quality of life questionnaire.The questionnaire was completed by50 patients(62.8%).The bariatric surgical procedure done in both groups was Laparoscopic adjustable gastric banding(LAGB) & Laparoscopic vertical sleeve gastrectomy(LVSG). Results:Average weight loss in both groups was more than 60% over two years time.No differences were seen in satisfaction of weight loss in post operative patients.Drastic correlations in amount of weight loss and QOL scores in females as compared to the males.Greater weightloss showed stastically significant positive correlation with improved self esteem,physical activity,social relations,personal hygience and eating patterns which were much better than pre operative groups. Conclusion:The results of this study show that QOL is better after surgically induced weightloss and is not related to type of surgical procedure performed. Some obese patients who had pre operative psychiatric or personality disorders counseling strategies post operatively.